The more we learn about artificial intelligence (AI) the more we learn how we think. AI often uses our thinking as a basis for its models. Two of them can aid us in assessing thinking skills in talent. Load-Recall and Generalize-Extrapolate are the two models. In Load-Recall (LR), loading is learning and committing to memory so we can recall later. In Generalize-Extrapolate (GE), generalizing involves seeing patterns in things so we can extrapolate how to address something similar. 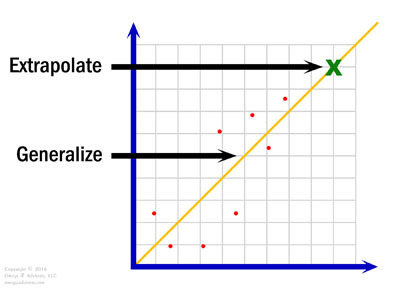 Generalize-extrapolate is one of two artificial intelligence models that help in assessing thinking skills. LR deals with loading such things as examples, rules, processes and formulae. We usually learn these externally. Someone taught them to us. We read them or saw a video. When we run across a situation to which they apply, we apply them. 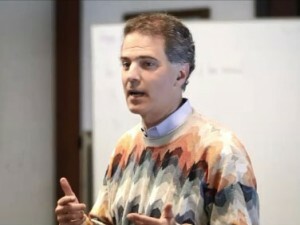 GE deals with creating guidelines about things we learn or observe. We see connections, similarities. The guidelines then help us extrapolate, figure out, what to do about a similar situation. For example, let us put out a fire. LR is about recalling that water is great for this. Somehow that idea was loaded in us. Someone might have taught us. We might have read it. We saw someone do it. There are not many fires on rainy days. We have never seen water burn. Water cools down hot things. I once told a mentor someone was bright because of an idea she told me. He asked, “Did she read it somewhere, or did she come up with it?” In assessing thinking skills, LR is the first, GE the second. Most people are a blend. Often they have a preference. The models help us work with them. If they lack exposure to something, GE can be hard to do. Adhering to a process might be best at first (LR). The situation might drive it too. If it requires strict adherence to a best practice or process, a LR person would do better. If it is different with uncertainty and volatility, a GE person would. AI is helping us learn more about ourselves. Skill assessments help us help people be more successful. We can play to their strengths. Why would assessing thinking skills not do the same?